The CCTMA provides services to approximately 26,000 employees along the Clifton Corridor. Founded in 1998, the purpose of the Clifton Corridor Transportation Management Association is to enable employers within the Clifton Corridor to work cooperatively among themselves and with other governmental agencies, transportation providers and other interested persons and entities to address common transportation concerns; provide and share transportation services in order to reduce traffic congestion in and improve accessibility to and within the Clifton Corridor. There are seven TMAs operating in the following activity centers: Perimeter, Emory, Buckhead, Midtown, Atlantic Station, Atlanta Airport and Downtown. The TMAs help mitigate congestion within their local jurisdictions through various Transportation Demand Management (TDM) options including vanpooling, carpooling, riding public transportation, as well as taking biking and walking initiatives and encouraging alternative work arrangements. Learn how you can become part of metro Atlanta's solution to reduced traffic and cleaner air. All while gaining time back for yourself and winning prizes! The CCTMA provides member services to employees to the various hospitals, non-profit organiations, and government agencies in the Clifton Road area. Emory Transportation and Parking employees oversee the administration of the CCTMA. 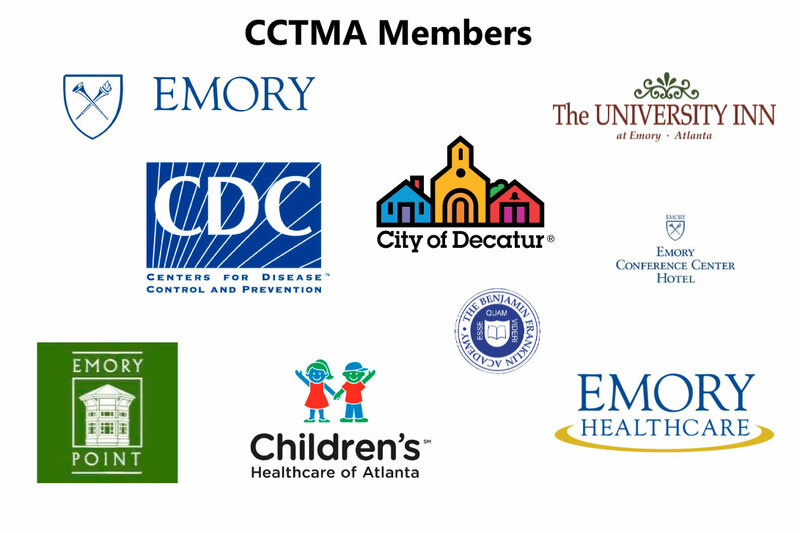 CCTMA Board Members are representatives from each member organization. © 2016 CCTMA All Rights Reserved.